We arrived in Vang Vieng, Laos excited to see what all the “In the Tubing” fuss was about, anxious to get in the river and get the tubing underway. We jumped in the river with our tubes and paddled to the first of dozens of bars where locals stand on the riverbanks with rope and floating objects to pull you to the bar and offer you free whiskey. The river is lined with rope swings dropping you into the water at nearly every bar. There is a sign posted at the bottom of the stairs leading to the rope swing stating, “Have some drinks before swinging” so extreme intoxication is encouraged and promoted. As I went off the swing by myself and as doubles, we were having a blast not seeing any danger involved except possibly getting a bruise from landing incorrectly in the water and smacking the surface. People were screaming and jumping in to pull me out because I appeared dead in the water. Luckily, Rob was able to grab me, turn me over, and pull me to the side with the help of some other people who had jumped in. My head was split open and after about a minute or so, I started twitching and regained consciousness but was clearly unaware of what happened, confused, and afraid by being surrounded by so many people. Rob was the only person I trusted enough to let get close to me and he explained I was bleeding, seriously hurt, and needed to get to a hospital in a hurry. I agreed to go and he held my head together with a jacket to slow the bleeding while I held onto him. Arriving at the very simple hospital in Vang Vieng, the nurse refused to stitch my head without payment. While I continued bleeding profusely, Rob argued until they agreed to sew me up after someone signed a promise to pay. They shaved the top of my head along the 5-inch gash and began to stitch me, however, the hospital had limited supplies and equipment and the pain medication available wasn’t strong enough. It was clear I could feel every stitch as they sewed my head by my screams, biting and clenching Rob with each stitch. How grateful I am to not remember any of this part. The water I had just come out of was extremely dirty and infection was going to be a risk along with undetected internal bleeding. My head already began to swell and it was clear that I was going to have a concussion. There wasn’t X-ray or CT scan machine available at the hospital for further testing so the nurses gave me antibiotics, iodine and pain medication (paracetemol) and sent me away with my friends. The first thing I can remember is being back in my hotel room a couple hours later and having my friends staring at me uncertainly. When I tried to sit up the room began to swirl and I knew something was wrong but couldn’t remember a thing right before the accident until that moment. As they began to fill me in on the details of the past few hours, it felt like I was hearing a story about someone else. My head was so sore and heavy and when touched my head, I could feel the bandages covering the top of my head. After listening to the whole story, they helped me up to look in the mirror and I couldn’t believe the reflection staring back at me. There was a shaved strip on top of my head with iodine and blood soaked gauze sewn over the stitches and my forehead and eyes were swollen. My first reaction was horror from them shaving my hair but I was so dizzy I could barely stand up and had to lie back down immediately. My equilibrium was so out of balance that I could barely lift my head off the pillow without causing the room to spin around me. Everyone was so relieved I was alive because when I came floating up, they thought for sure I was dead. Clearly, I was upset by the injury but I don’t think I realized how serious it had been and was most concerned about my shaved head. When I woke up in the morning, I was dying of thirst but every time I tried to sit up the room started to swim in front of me. Feeling my head, it was even more sore and swollen than it had been the night before. It all seemed like a really bad dream, but in fact there were still bandages on my head and it was a reality. In town later that day, it seemed like everyone I saw had additional details to share about witnessing the accident and it began to really hit me how serious the injury was and how lucky I was to be alive. It was frightening to hear so many people tell me they thought I was dead but put things into perspective about how quickly that could have happened had Rob not been able to pull me out before I was swept unconscious down the river. Here it is 4 months later and my wound has healed and the concussion is long gone. It took a good 3.5 weeks before I could sit upright and not have a moment of dizziness. The hair has grown back in where they shaved it and sticks up in funny directions but I am pretty much back to normal. I ended up going to Vientiene, Laos to get a CT scan to ensure I didn’t have any internal bleeding and then took a few weeks in Luang Prabang, Laos to take it easy and rest my head, literally. The experience was quite the roller coaster ride of emotions, mostly fear and anxiety, especially dealing with the hospitals in a 3rd world country. Its frightening enough to be injured but to not be able to communicate with the doctors about your condition and treatment was a nightmare. Of course you can try to be as careful and cautious as possible, but sometimes accidents just happen that are out of your control when traveling and engaging in risky behavior. I went back to the Bar III rope swing a few days after the accident and watched people dropping into the water for about 30 minutes and saw at least 2 close calls. The place where people drop in the water is right above where they are pulling people over to the side and it could have easily happened again to someone else. I just happened to be in the wrong place at the wrong time. People keep asking me if I would return to Vang Vieng and In the Tubing. Of course I would, but I would look at things a bit differently and be more cautious of not only my actions but also those people around me. There isn’t anyone looking out for you on that river so you need to be aware of the unsafe environment around you and intoxicated people who aren’t looking out for their own safety, let alone yours. People die out there every year and many more people get hurt than we know about because it’s not recorded. I agree it is a lot of fun but it is good to also be aware of the dangers involved and know that there is a greater risk for injury. We all want to have fun and enjoy new experiences when we are traveling the world but those good times can end quickly when accidents happen. World Nomads travel insurance policies (as with most travel insurance policies) do not provide cover where you are deemed to have exposed yourself to a needless risk and where you have not taken reasonable care. Being intoxicated and/or under the influence of drugs will also mean travel insurance policies will not cover you. If you are unsure about cover for any activities you want to do while travelling you can always contact your insurer to discuss. One of the biggest problems with alcohol is that it impairs judgment, let alone good judgment. Mix alcohol with the hedonism and excitement of travel, and add a dash of getting a good old egg-on from your travelling buddies and you have a recipe for potential disaster. Especially if it involves swinging from great heights off rope swings. The Laos tubing experience is an attraction for many travellers, but it is also one of the craziest and most risky. We can't tell you how many people we have seen in the aftermath of that adventure with split heads, open gashes and worse. We can't tell you what to do, but there are a few things we ask you to keep in mind when you are travelling. Is a drunken swing off a rope into foreign waters worth weeks in hospital, and potentially dying? You work and save hard for months and months to have an adventure experience, only to have it dashed from you after a stupid decision. Is it really worth it? Everyone likes to take risks. It's what makes us feel alive, and it's that feeling that urges us to explore the world. But a good traveller knows the difference between a risk and an act of stupidity. A good traveller can enjoy themselves without having to needlessly risk their life. We understand it's a totally different story when you are drunk and in the thick of a party. Things happen when you are drunk. We know that. But when you are on the road, you really need to ask, are you there to experience the world, or experience being wasted? Like we said, we can't tell you what to do, everyone makes their own choices. But if your choices are considered, then you will have a safer and more enriching trip! Well, I finally feel like I can share this experience with other people, even though I will probably never tell my family what happened b/c they would freak out too much!! In November of 2008, I spent about 2 months backpacking across SE Asia. 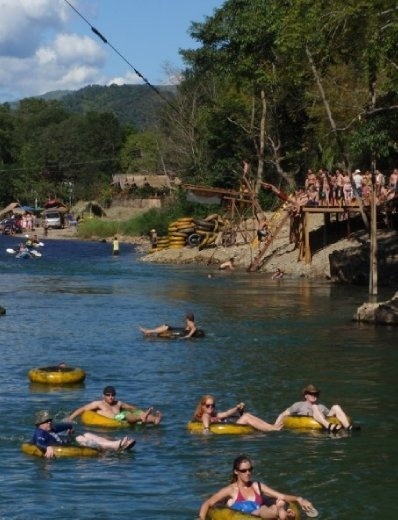 While I was in Vang Veing, Laos, I decided to go tubing a couple of times b/c it seemed like such a blast and all I kept hearing about was the tubing experience from other travelers. Well, the 2nd day of my tubing experience turned out to be something that I think about on a daily basis, still to this day. I can easily tell you what a blast it was and how much fun I had at all the bucket bars and playing mud volleyball with everyone. However, it was also one of the scariest days/nights/mornings of my entire life. For anyone who has not been tubing along this river, there are small pickup trucks that locals use to transport the tourists from the river to their lodging and back and forth. At the end of the line/river, where the trucks pick you up, I got into a truck that looked just like any other truck that I had been seeing transport travelers. I can even remember there being about 3 or 4 other guys in the back of the truck with English accents. However, I didn't know anyone else in the truck because I had just been separated from the group of people that I had been with for the past several hours. After getting into the back of the truck, I can still recall the passenger of the truck handing us a bottle of whiskey and telling us to drink and have fun! Of course, no one thought twice about it, and so we all took a gulp and passed it to the person next to us. And THAT was the LAST thing I can remember before ending up on a dirt road in the middle of nowhere, being forced out of the the back of the truck by the 2 local men that were driving it. They took my dry-bag, which contained my camera (with about 1,000 pictures, and the cash in the bag, which was only about $60 USD) By the time this was all taking place, the sun was already starting to set and when I say I was in the middle of nowhere, I mean NOWHERE. Just a small dirt road and thick, never ending jungle of each side of the road. I walked down this dirt road that was only about 5 or 6 feet wide for hours, with nothing but my swim trunks and flip-flops on and for some reason decided to continue carrying the intertube that I had rented that day. (And in November in Laos up in the mountains, it gets pretty chilly at night.) Finally after about 3 hours of walking, screaming, yelling, and crying out for anyone to possibly hear me, I realized it was not gonna happen this night. I happened to walk by and notice what appeared to be either an abandoned house or a house that someone started to build and never got around to finishing. In my mind, I thought, maybe I can go into this house and sleep for a while and whenever I wake up, it will be daylight again and surely some civilization had to be near there. Well, I can still remember that freezing cold floor, using the intertube as a pillow for my head, I laid down and actually happen to fall asleep for what seemed like a couple of hours before waking up to the hundreds of mosquito's that were covering my body and would not leave me alone. So finally, I just decided to get up and keep walking even though I could barely see 3 feet in front of me b/c it was so pitch black that night. I kept on screaming and yelling for someone to hear me as I walked, but all I got in return was the sound of insects, birds, and whatever else was moving around in the jungle that night. Well, eventually, after walking for several more hours, the sun was somewhat starting to come up. THANKFULLY!!! I could start to see what was out in front of me again!! And then once the sun was up, I was passed by local villagers on mopeds every so often. And every time they were in sight, I tried to get them to stop and take me back to Vang Veing, where my friends were and I needed to be. But they all looked at me like I was from another planet!! And it was obvious that some of them had never actually seen a person from outside their native Laos in their lifetime in person before. Well this went on for a while, but thankfully I was seeing life again, which I had almost considered to be long gone just a few hours before this. Luckily a man on a tuk-tuk type of thing stopped his ride after I jumped in front of him and didnt give him any other options. I tried to explain what happened to him, but he did not speak a word of English. But, I was able to communicate that I was staying in Vang Veing, which he understood and then pointed in the opposite direction that I had been walking all along. He agreed to give me a ride back to town after begging and pleading with him for several minutes. I dont know where I was, or have any idea where they had dropped me off the evening before, but it was no where close to town!!! It took quite a while to get back into town from where this guy picked me up!! Needless to say, I was pretty shaken up by this whole experience and was just about to call the trip quits and fly home, but somehow decided to give it another shot. This was about 2 weeks into my trip, and I ended up traveling for another 6 weeks or so after that, and so glad I did. Now, I am not trying to tell anyone to not go to Laos or any other country to travel. That is not my point of telling my experience at all. I still continue to travel solo every year, and I encourage it as well!! I just realize now how easily something could have happened to me out in that jungle, and NO ONE would have had any idea what to think or even the slightest clues at to where to start looking. NO ONE. Just always try to let someone, anyone know where you are going and who you are going with, when out of the country like this. At least if my friends or even anyone for that matter would have seen which truck I got in, they would have had some idea as to where and who to ask if I never turned up. AND, be VERY CAREFUL who gives you drinks, especially alcohol, b/c you never know if there is something else in it besides liquor or what their intentions might be.